Wagon Tales, under jockey Rodrigo Vallejo, pulled two other qualifiers into the million dollar Heritage Place Futurity while winning the second trial on Saturday. OKLAHOMA CITY, OK�MAY 11, 2013�Full brothers PYC PAINT YOUR WAGON and IVORY JAMES dominated the $1,000,000 Heritage Place Futurity trials over two nights at Remington Park, siring half-the field. Brimming with confidence off his win in the $100,000 Remington Park Juvenile in late April, Wagon Tales won his trial Saturday night to post the top 350-yard clocking from the nine heats on the second evening of trials activity. Owned by JNB Enterprises of Mission, Texas and trained by Judd Kearl, Wagon Tales was ridden by Rodrigo Vallejo. The colt had no issues in cruising to his second straight win, crossing the finish in :17.242 seconds over the fast track. The Mixer Ranch bred the 2-year-old colt, by PYC PAINT YOUR WAGON from the Shazoom mare Signs Zoomer, in Oklahoma. Trainer Kearl signed the $33,000 ticket on Wagon Tales from the Lazy E Ranch, Agent for Mixer Ranch September Heritage Place Yearling Sale consignment. Joining Wagon Tales into the finals from the second trial (race 5) were second fastest qualifier This Candy Says Bye and fifth qualifier Sheza Lady James. This Candy Says Bye made her career debut in the trials for owner/breeder Carl C. Pevehouse and trainer Clinton Crawford. A homebred, also by leading sire PYC PAINT YOUR WAGON , was ridden by Cody Jensen. The black filly is out of Eye On This Candy, by Mr Eye Opener. The aforementioned Sheza Lady James finished a neck off This Candys Says Bye in the fastest trial, holding on to the final qualifying spot on Saturday with a :17.570 clocking. G.R. Carter, Jr. rode the IVORY JAMES homebred for owners Duwyne and Janice Pfeifle and trainer C. Dwayne Gilbreath. Out of the Takin On The Cash mare Sheza Ramblin Too, Sheza Lady James has finished second and third in two starts. These three finalist will be joined in the June 1st final by Friday's second fastest qualifier Bp Wagon Train, by PYC PAINT YOUR WAGON and final qualifier Beatie Feathers, by IVORY JAMES. (See Related Story). For the complete list of Heritage Place Futurity(G1) finalists from both nights trial races, including times, sires, dams, owners, breeders, trainers and jockeys CLICK HERE. The second five fastest qualifiers from both nights of trials will be preferred invites for the $75,000 Guaranteed Heritage Place Juvenile Invitational to be run back on Saturday, June 1. For the second ten fastest from the trials CLICK HERE. 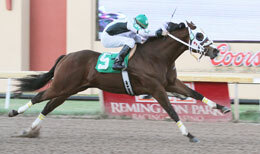 Sunday racing at Remington Park will feature the $100,000 Bank of America Oklahoma Challenge Championship as well as six trials for the $275,000 Heritage Place Derby. The first race is at 1:30pm. Open daily at 10:30am for casino gaming and simulcast racing, Remington Park is the home of the $1,000,000 Heritage Place Futurity on June 1. Featuring the Bricktown Brewery on the casino floor, admission, general parking and valet parking are always free at Remington Park.